When triggering abilities by paying an activated ability's cost, which comes first, the activated ability or the triggered one? Does Thragtusk + Infinite Reflection + Gigantiform work? kiki-jiki, mirror breaker + thragtusk makes a token, when it dies I still get the 3/3 right? 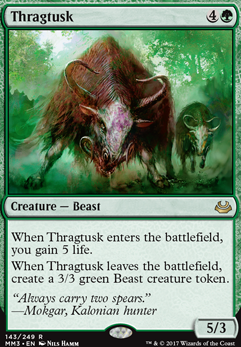 When Thragtusk leaves the battlefield, create a 3/3 green Beast creature token.